"These are a big hit in the summertime when everyone is tired of the same old hamburgers and hot dogs. Serve with or without buns and your favorite condiments. I like to serve these with lettuce, tomato, and Tzatziki sauce (you can find recipes for that on this site as well)." 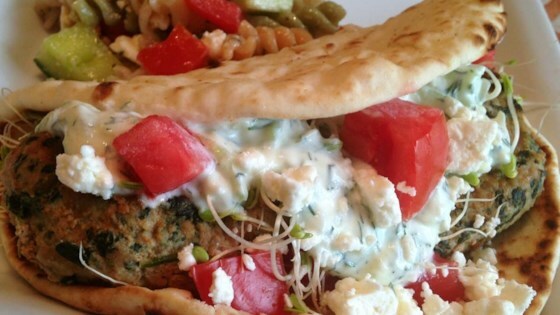 Find recipes for Tzatziki Sauce to top your burgers, if desired. WOW. My husband asked for seconds! I used fresh spinach and cooked it in the oven because it wasn't grill weather. Turned out great! I have cooked this twice. Once using tradintonal beef and once using turkey. The turkey burgers were ok, but when using regular beef they were fantastic! Hi all...this is my recipe. I didn't even think about it when I wrote the recipe, but i usually do make the burgers ahead of time and chill for at least an hour....hope that helps!